The 2004 Harley Davidson Softail Trike for sale in this classified is my pride and joy but after I was injured; I can no longer ride..
You will definitely want to look at my Harley trike motorcycle; she is a beauty. Anyone who wishes may use the comments form below this ad to write a review or voice any opinions that you may have formed from your personal experiences with a similar trike for sale. 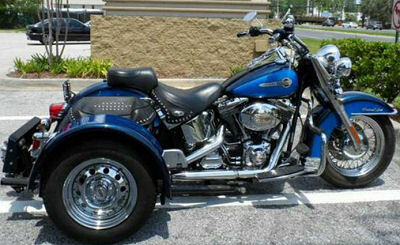 Thanks for visiting GoGoCycles Used Motorcycles for Sale and for your interest in the Harley Softail for Sale. The location of the HD Softail Trike for sale is Tampa FL Florida near Fort Myers FL Florida and my asking price for this nice rig is just $16000! If you want to take a look or have questions, get in touch for more details or to request pictures of the HD Softail Trike and don't forget to mention that you found this ad on GoGoCycles Used Motorcycles and Parts for Sale www.gogocycles.com. I live in Florida an interested so if you still have it you can email me at roljan9@ aol.com Thanks! Looks like I could be in love...wow! The bike is located in Albuquerque and I'm asking $23K OBO. The basic bike before the Champion trike kit was $7K and more than $25K of upgrades were added with the trike kit to include a bigger engine, new Mustang dual seat with back rests, lots of chrome, new windshield, leather removable pack, lots of trunk space, spoaked wheels, new front tire last year. Rear tires only 4 years old. twice yearly maintenance every year and weekly washed and waxed body. Could you please give me your location and what you are asking? I am exremely interested in your trike and would like more details. You can also call me at 515 991 2108.
first off where are you located, what state. and is it still for sale. and for how much.